Several weeks ago we saw Fast Food Boulevard open in Springfield USA at Universal Studios Florida, but there were still walls up all along the waterside. 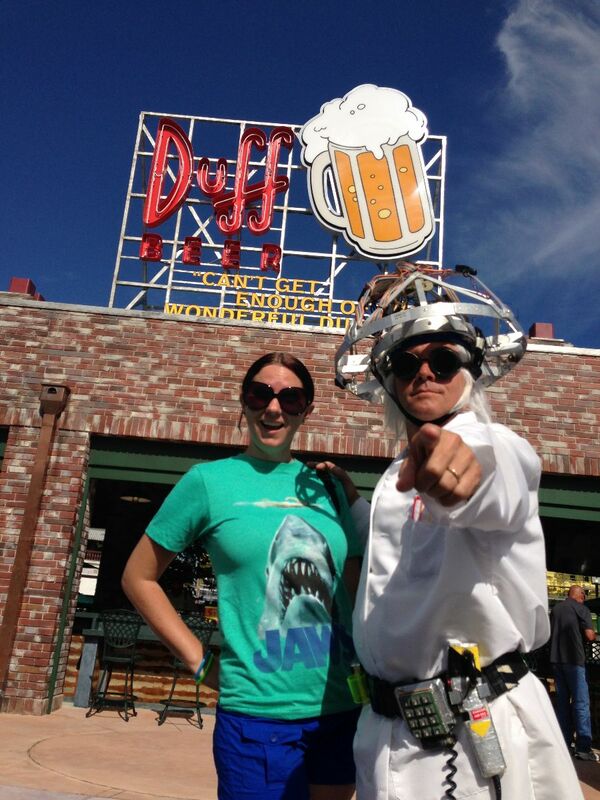 Yesterday those walls finally came down to reveal Bumblebee Man’s Tacos, Lard Lad Donuts, Duff Brewery, and more! The walls are still up around Kang and Kodos’ Twirl ‘n’ Hurl, but even that should open next week. My first impression of the new area was how much it felt like I was walking into an episode of The Simpsons. The cartoonish design and bright colors were whimsical and fun. It reminded me of how I felt walking into Toontown the first time as a kid. 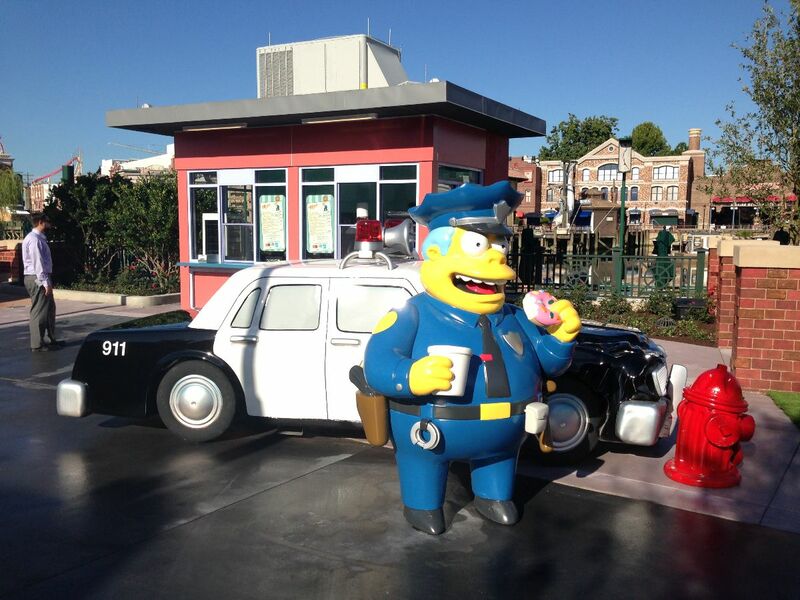 There were so many iconic landmarks from the show: Lard Lad, Jebediah Springfield’s statue, the Duff Brewery…as well as statues of characters like Chief Wiggum, Milhouse, and Duff Man. 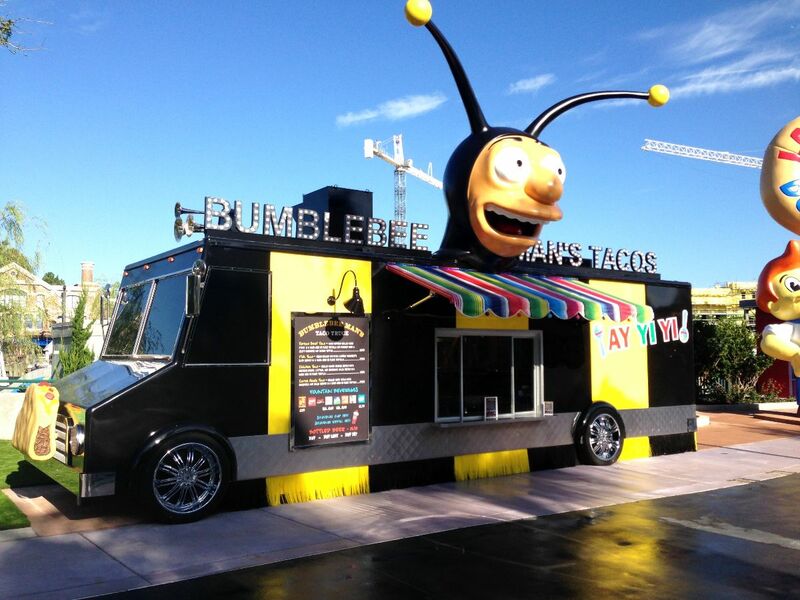 The first new thing I encountered was Bumblebee Man’s Tacos. Being from Southern California I love a good taco truck. This one was much larger and cleaner than the ones I’m used to, but I was still really excited to try it out. It doesn’t open until 11am, so I had to wait til lunch time to try them out. Next up was Lard Lad Donuts. 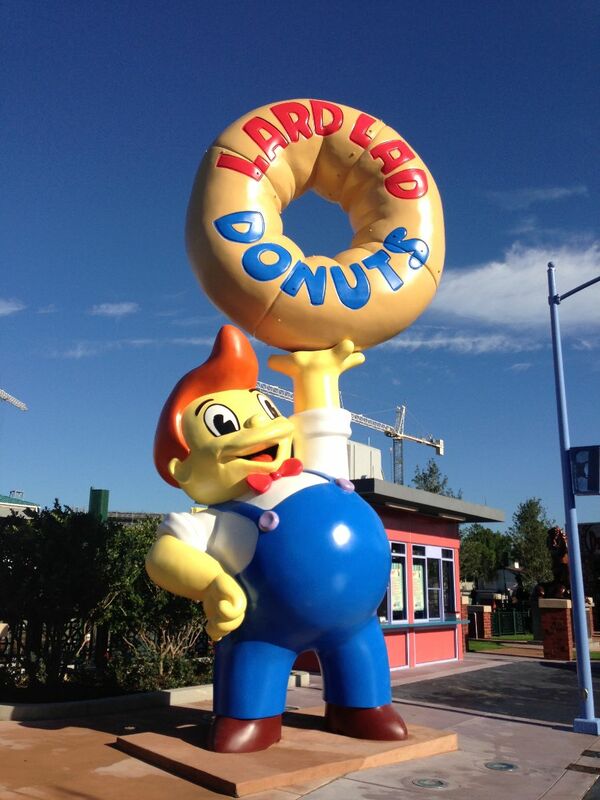 I was impressed with the massive recreation of the Lard Lad out front from the show. A blatant Bob’s Big Boy rip-off, the Lard Lad brings old-school charm and heart-attack goodness to Springfield. I’m not the world’s biggest donut fan…but I do love ice cream and ridiculous foods. Obviously I was immediately drawn to the Brain Freezin’ D’oh-Nut Sundae. It was a pink frosted donut with sprinkles, cut in half, filled with soft serve ice cream, topped with whipped cream, cherry, and a topping of my choice. Toppings included caramel, Oreos, peanuts, Reese’s Pieces, and more. Okay. I know it was 9:30am and clearly breakfast time…but donuts are a breakfast food. And ice cream is made of milk…and milk is acceptable for breakfast. So, I tried the sundae. We took it down to one of the waterside tables to try it out. Oh, man! It was amazing! The donut was fresh and fluffy, not too dense. The ice cream and Oreo cookie pieces were a delicious touch. I highly recommend this sundae…although probably not for breakfast. 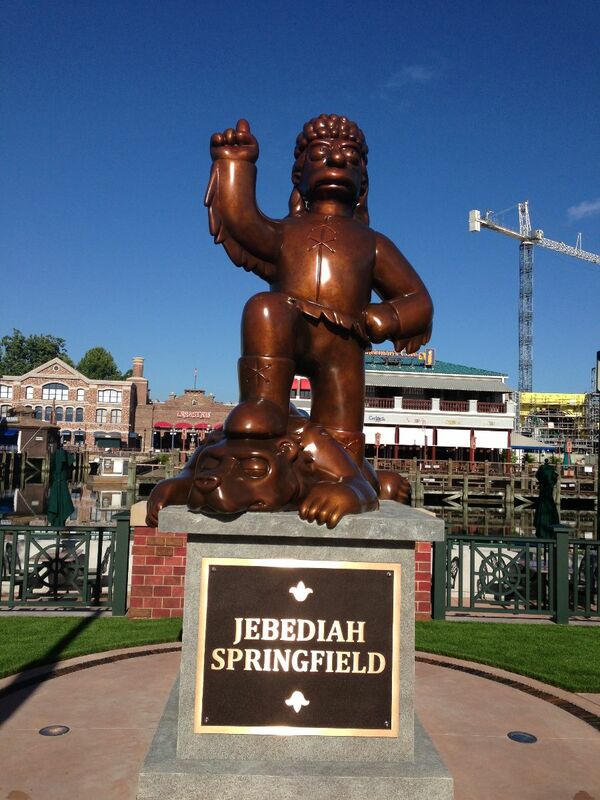 To get to the waterside table we had to walk right past the iconic Jebediah Springfield statue. Jebediah Springfield is the town’s founder whose most famous quote (which is on a plaque on the back of the statue’s base) is: “A noble spirit embiggens the smallest man.” The statue is a centerpiece of the town, and it is major plot point in several episodes of The Simpsons. While the Duff Brewery still wasn’t open (it also opens at 11am), but it was still fun to look at. 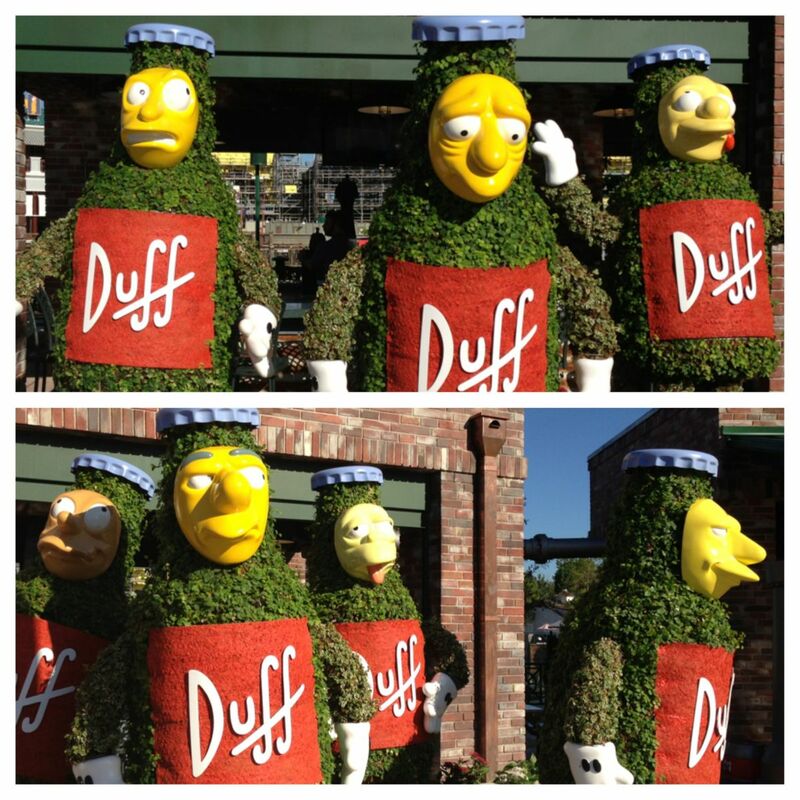 In the Brewery Beer Garden area you can see the Duff stills, Duff Man, and topiaries depicting “The Seven Duffs” (Tipsy, Queasy, Surly, Sleazy, Edgy, Dizzy, and Remorseful). There is also a large sign with Duff Beer’s motto: “Can’t Get Enough of the Wonderful Duff!” The brick bar area served Duff (obviously), Squishees, and bar type snacks like chili dogs and peanuts. There is also a video loop playing on televisions above the bar depicting some of Homer Simpson’s more embarrassing moments while drinking Duff. 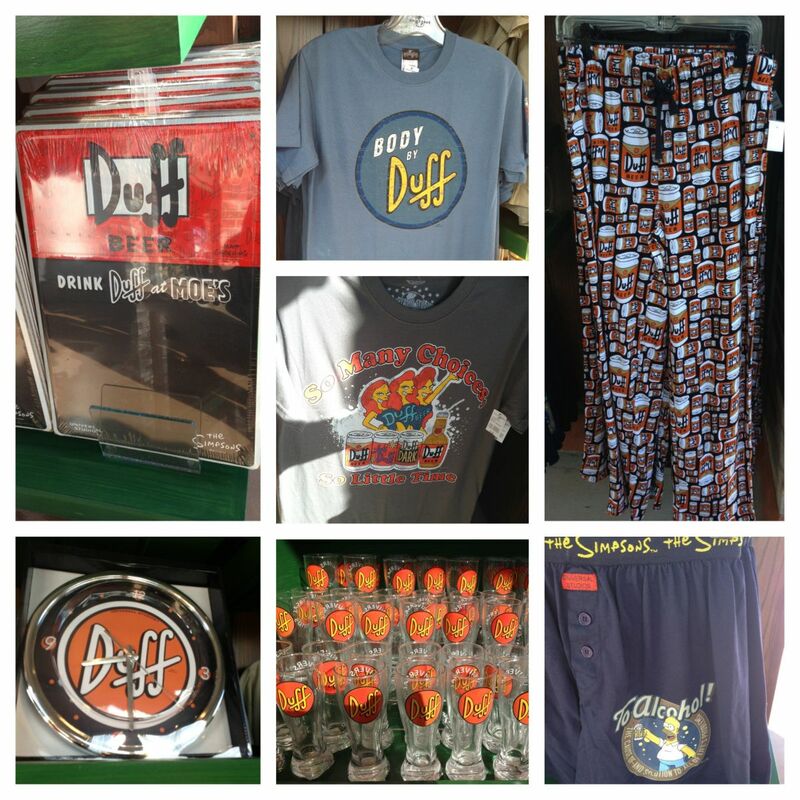 The store features all kinds of Duff merchandise: t-shirts, boxers, shot glasses, phone cases, hats…all the usual stuff. It also has things like clocks, mini chalkboards, and pint glasses to decorate your own home bar. While I have no particular love for Duff, I adore seeing theme parks spend money on really specific merchandise like this. I would rather spend my money on something unique from an area of a park I love than buy another generic “2013” sweatshirt. After I had seen the new areas I had time to kill until Bumblebee Man’s Tacos and the Duff Brewery Bar opened. 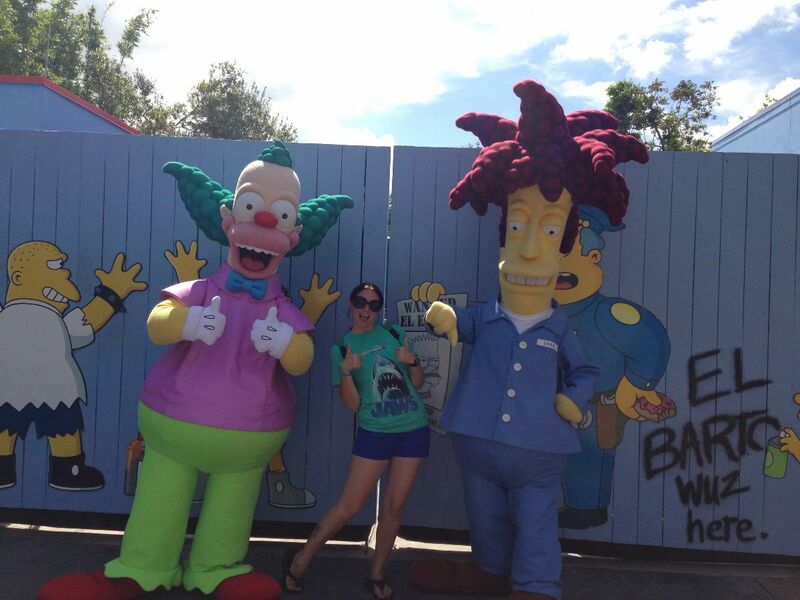 Luckily, the Simpsons were on hand doing meet and greets in their new neighborhood! I got to meet the whole family (minus Maggie) at the wall between the Kwik-E-Mart and The Simpsons Ride. Although I had met them several times, it was exciting to get my picture with them in Springfield USA. Shortly after they left I got to meet two characters from the show I had never met before: Krusty the Clown and Sideshow Bob! My interaction with them was so fun! Krusty was silly and kept doing funny poses and gave me a high-five…while Bob was surly, wouldn’t shake my hand, and refused to do my signature pose in our picture. Instead of my thumbs up he gave a thumbs down. Finally it was time for the Taco Truck to open! I went with a friend and we ordered two different types of tacos: Korean Beef and Carne Asada. The team members at the truck were definitely still getting used to the new location, but they were really nice and were trying really hard. We asked about passholder discounts, and they said they did offer them and gave them to us. 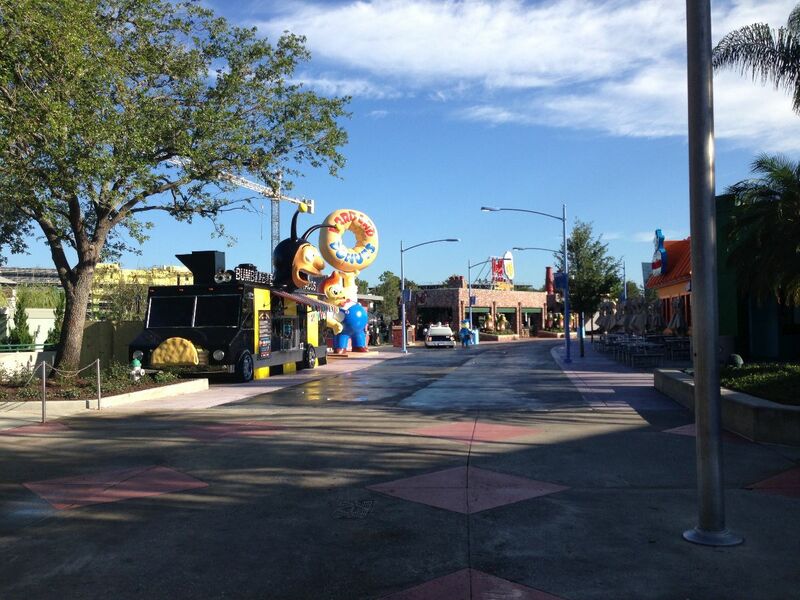 However, Attractions Magazine tweeted that they were told there were no discounts, so that may have been a mistake. The Team Members also let us know that if you don’t specify corn or flour tortillas when you order, they default to flour. We decided to take our food and grab a seat at the bar at Duff Brewery. That way we could have shade and beers while we ate lunch. First off, the tacos: oh man, the tacos were so good! 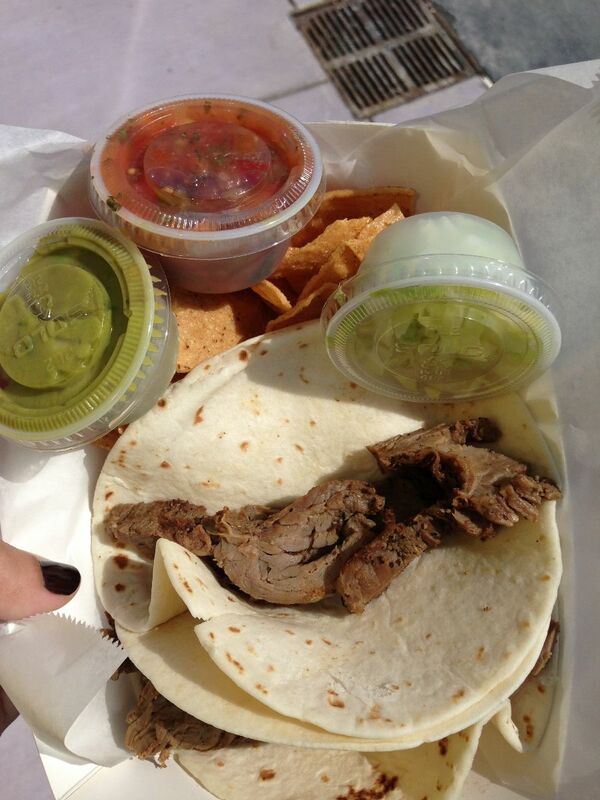 The Carne Asada was tender and well-cooked, I also thought there was a good amount of it in the taco. The guacamole and salsa weren’t great…the guacamole tasted a bit “fake”…but for a theme park food truck it was good. The tacos also came with a side of tortilla chips. These were fresh but a bit thick for my taste. However, the flavor was good, and since I got my guacamole and salsa on the side of my taco, I had something to dip them in. 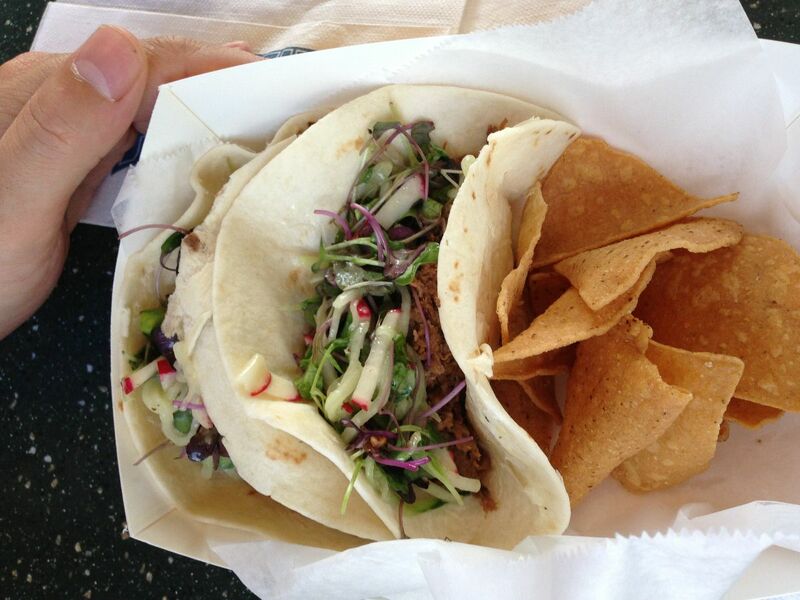 The Korean Beef Tacos were also delicious: well seasoned with a delicious cucumber and radish slaw. Normally these types of pickled vegetables aren’t my taste, but everything went so well together! I highly recommend both types of tacos we tried. After we had eaten we heard several Team Members suggest the Fish Tacos, which they said were a staff favorite. I really want to go back to try them! 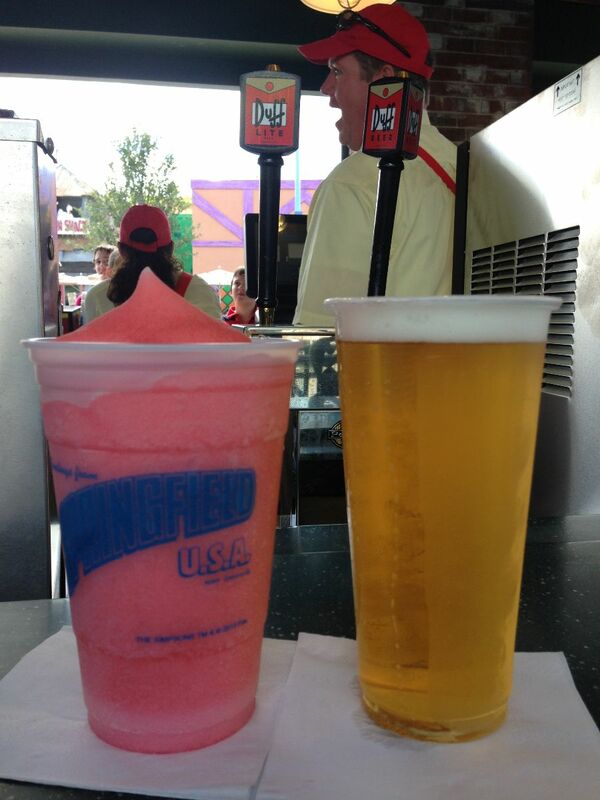 With lunch I had a Duff Lite and a Raspberry Lemonade Squishee from Duff Brewery. The Squishee was very good: lots of syrup (though not all syrup), large portion, tart and sweet…a perfect frozen drink for a hot day. The Duff Lite was good, also. I’m not really a beer drinker a,nd this was right up my alley, light without a ton of hoppy flavor. Overall this new area is a win: Good drinks, great food, cohesive themeing, fun characters, unique merchandise. It has so much of what I look for in a theme park. Obviously the new Twirl ‘n’ Hurl ride is still not open, but I think that will make this a really remarkable area. I love it. Great post. And food trucks are awesome. Lol. He sure does. He meets by his Delorean right next to Springfield. 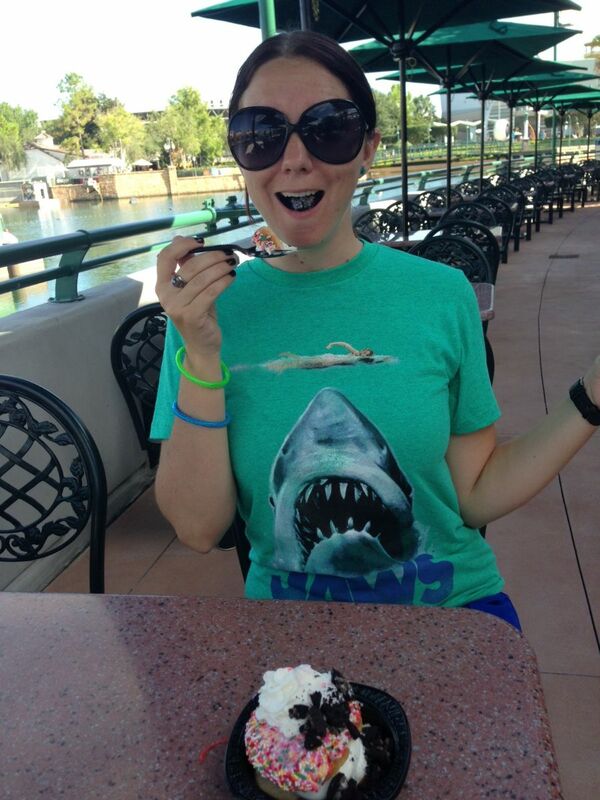 I think my Jaws shirt makes this picture extra funny. Great summary. I can’t wait to see it. Does the gift shop even sell “Bort” license plates? That would be awesome if they did! I fear I may gain 10 pounds from the Simpsons area alone durimg my vaca in January! I completely understand that! So many good things to eat there. Looks like so much fun! We saw it when it was only half open so can’t wait to see the rest, and LOVE your Jaws shirt btw! Last time I was there, I got a Bort coffee mug. Best.Themepark gift. Ever.